An illustrated history of the evolution of British women's cycle wear. The bicycle in Victorian Britain is often celebrated as a vehicle of women's liberation. Less noted is another critical technology with which women forged new and mobile public lives-cycle wear. 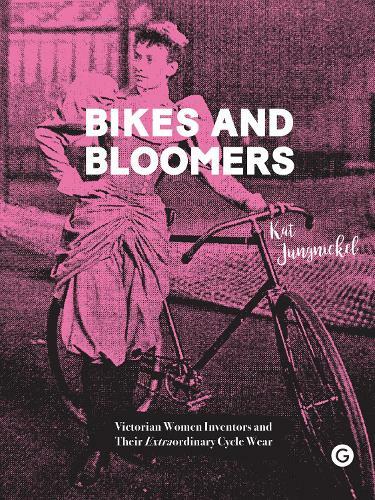 This illustrated account of women's cycle wear from Goldsmiths Press brings together Victorian engineering and radical feminist invention to supply a missing chapter in the history of feminism. Despite its benefits, cycling was a material and ideological minefield for women. Conventional fashions were unworkable, with skirts catching in wheels and tangling in pedals. Yet wearing "rational" cycle wear could provoke verbal and sometimes physical abuse from those threatened by newly mobile women. Seeking a solution, pioneering women not only imagined, made, and wore radical new forms of cycle wear but also patented their inventive designs. The most remarkable of these were convertible costumes that enabled wearers to transform ordinary clothing into cycle wear. Drawing on in-depth archival research and inventive practice, Kat Jungnickel brings to life in rich detail the little-known stories of six inventors of the 1890s. Alice Bygrave, a dressmaker of Brixton, registered four patents for a skirt with a dual pulley system built into its seams. Julia Gill, a court dressmaker of Haverstock Hill, patented a skirt that drew material up the waist using a mechanism of rings or eyelets. Mary and Sarah Pease, sisters from York, patented a skirt that could be quickly converted into a fashionable high-collar cape. Henrietta Muller, a women's rights activist of Maidenhead, patented a three-part cycling suit with a concealed system of loops and buttons to elevate the skirt. And Mary Ann Ward, a gentlewoman of Bristol, patented the "Hyde Park Safety Skirt," which gathered fabric at intervals using a series of side buttons on the skirt. Their unique contributions to cycling's past continue to shape urban life for contemporary mobile women.